As a primary school student here in Toronto, many a field trip was taken to the Young People's Theatre at 165 Front Street East. I remember several of the plays I saw there, including The Story of Anne Frank, which has stuck with me to this day. The Young People's Theatre was where our youth got introduced to theatre. Last week I was contacted by a woman with the Lorraine Kimsa Theatre for Young People. She offered me complimentary tickets to see "You're a Good Man Charlie Brown" at what she referred to as LKTYP. Hmmmm, I wondered to myself. Could the Lorraine Kimsa Theatre for Young People by my old Young People's Theatre? It's one and the same. 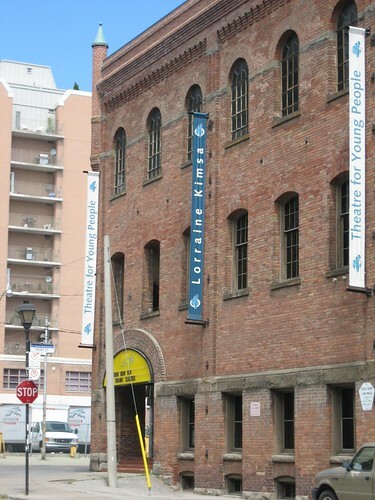 The company changed its name to the Lorraine Kimsa Theatre for Young People in 2001 to acknowledge an extraordinary contribution made by Kevin Kimsa to honour his mother, former president of the Canadian Dance Teachers Association, and co-founder in the 1980s of Broadway North, a community theatre. Here's hoping the only thing that's changed is the name. Ah, I remember Lorraine Kimsa fondly. Of course, it wasn't all that many years ago I last went, but it's nice to know it's getting some blogosphere coverage. I'm actually surprised it's been around for so long, but it's aged well, and still puts on some quality productions. Old farts like me know it as the Young People's Theatre... maybe they should have renamed it The Lorraine Kimsa Young People's Theatre? This thing's been going since 1966. I remember seeing Megan Follows in a show there twenty years ago. Isn't Humble on the Board of Directors for the YPT? He called me last night when he read this entry. He's the freakin' president of the Board of Directors, but he had nothing to do with this. In a strange coincidence, the Marketing person there contacted me b/c she reads this blog. In 1987, I played Linus in the Whitby Courthouse Theatre production of that show. Have fun! It's a good show! Kevin Kimsa is a great guy. I went to high school with him and he has done very well for himself. It's funny because I was just looking at taking my entire school to see a play of some kind and I saw the name 'Kimsa' and I wondered. I think it's great that he gives back to the community and can honour his mom like this. Good on you buddy. Take care.